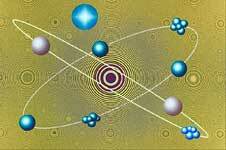 There are 2 types of particles, fermions which make matter and bosons which make forces. Fermions are particles which make matter, they all have a spin which is an 1/2 integer. The types are shown in this table, antimatter is the same but with inverse charge. The quarks (top two in table) are in nucleus. The leptons (bottom two in table) are outside nucleus. Bosons are particles which make forces (or do they just transport a force from one point to another ? I don't really understand this) For example electro-magnetism travels through materials that photons cant travel through? There is also something strange about the spin in that a rotation of 720 (not 360 degrees) is needed to get back to the original orientation. This can be modeled by quaternion (spinor) where a rotation of 360 degrees inverts all of its x,y,z and w elements. In other words, if we exchange two identical fermions we invert the wave function. This is equivalent to rotating the system by 180 degrees. This accounts for the pauli exclusion principle because if two identical particles were superimposed the wave function would be zero. Book Shop - Further reading. Where I can, I have put links to Amazon for books that are relevant to the subject, click on the appropriate country flag to get more details of the book or to buy it from them. A different universe: reinventing physics. Where I can, I have put links to Amazon for commercial software, not directly related to the software project, but related to the subject being discussed, click on the appropriate country flag to get more details of the software or to buy it from them. This site may have errors. Don't use for critical systems.